Dubai, UAE, March 21, 2018: Emirates was the first international airline to land a scheduled commercial flight at the newly inaugurated passenger terminal at Muscat International Airport last night. 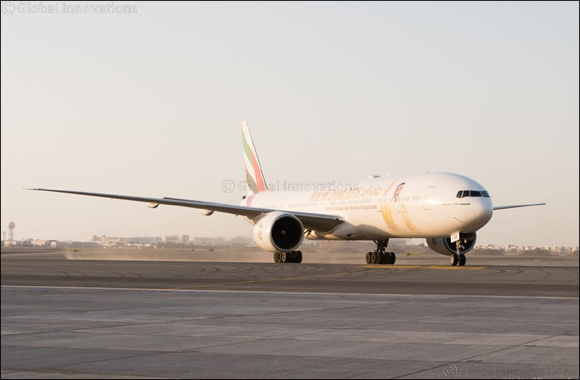 To mark the occasion the airline deployed one of its special ‘Year of Zayed’ Boeing 777-300ER aircraft, highlighting the ties between Oman and the UAE. Flight EK 864 landed at 5:55pm, and was the first international flight to operate to the new passenger terminal. Passengers on board came from destinations like Dhaka, Baghdad and Dammam via Dubai. Emirates has been flying to Oman since 1993, and will be marking 25 years of successful operations this year to the country. The airline currently operates three daily flights to Muscat, connecting Omani travellers to over 150 global destinations.